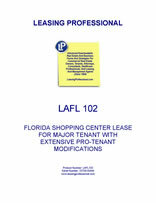 (a) Landlord, in consideration of the rents to be paid and covenants and agreements to be performed by Tenant, does hereby lease unto Tenant the premises (hereinafter referred to as the "premises" or "demised premises") in the shopping center commonly known as ____________, in the City of _________, and State of Florida. Landlord owns a portion of such shopping center containing approximately ________ square feet of leasable space on approximately ___ acres (hereinafter referred to as the "Shopping Center"). The location, size, and area of the demised premises and of the Shopping Center shall be substantially as shown on Exhibit "A-1" attached hereto and made a part hereof. A legal description of the Shopping Center is shown on Exhibit "A-2" attached hereto and made a part hereof. Landlord shall not change the configuration of the Shopping Center so as to materially adversely affect access to, visibility of or parking for the premises without the prior written consent of Tenant. (b) The demised premises shall have a ground floor area of approximately ________ square feet with approximate dimensions of _______. The term of this Lease shall be for a period of ________ (___) years, beginning on the commencement date (as hereinafter defined), except that if the commencement date shall be a day other than the first day of a month, then the period of time between the commencement date and the first day of the month next following shall be added to the term of the Lease. (a) As herein used, the phrase "commencement date" shall mean the earlier of: (i) the day Tenant opens for business in the demised premises, or (ii) ninety (90) days after Landlord has delivered to Tenant possession of the demised premises as same are to be substantially completed by Landlord and ready for occupancy, as in (b) below. Landlord agrees to deliver the demised premises to Tenant with Landlord's work completed between _________ and ________ (the "Delivery Period"). If Landlord does not deliver the demised premises to Tenant as required herein by ________ ("Final Delivery Date"), Tenant may defer delivery until _________. If Landlord does not deliver the demised premises to Tenant thereafter on or before __________, Tenant may terminate this Lease or defer delivery until _________. In the event that the demised premises and Landlord's Work are not substantially completed and delivered to Tenant on or before the Final Delivery Date, the minimum rent due hereunder shall be adjusted so that, after the Rent Commencement Date, the Tenant shall receive a credit against minimum rent thereafter due Landlord equal to one (1) day of minimum rent for each day after the Final Delivery Date until delivery of the demised premises is made to Tenant consistent with the terms of this Lease, including substantial completion of the Landlord's Work. Tenant shall not be obligated to accept possession of the demised premises prior to the later of (a) substantial completion of Landlord's Work, (b) the first day of the Delivery Period and (c) the Final Delivery Date. Time is of the essence regarding all dates set forth in this Section 3(a). Landlord shall obtain a certificate of occupancy for the demised premises as part of Landlord's Work. (b) Possession of the demised premises shall not be deemed to have been given to Tenant unless the demised premises are ready for the installation of Tenant's fixtures and finishing work by Tenant, and are free of any violation of laws, ordinances, regulations and building restrictions relating to the possession or use of or construction upon the demised premises, and until Landlord has substantially completed Landlord's Work as set forth on Exhibit "B", attached hereto and made a part hereof. Tenant shall supply Landlord with Tenant's prototypical plans and specifications, and Landlord shall prepare plans and specifications for the Premises at Landlord's expense, for Tenant's approval. All such Landlord's Work shall be done at Landlord's expense and in compliance with all applicable federal, state and local laws, rules, regulations and code requirements. Landlord shall obtain a certificate of occupancy for the demised premises as part of Landlord's Work. (c) Prior to the date on which possession is delivered to Tenant as aforesaid, Tenant shall have the right to enter the demised premises at its own risk rent-free for the purpose of preparing for its occupancy, installing fixtures and equipment, and receiving merchandise and other property, provided that it does not unreasonably interfere with Landlord's construction activities. All work other than that to be performed by Landlord is to be done by Tenant within ninety (90) days after the date possession of the demised premises has been delivered to Tenant, at Tenant's expense in accordance with the provisions of this Lease and as set forth in the schedule entitled Description of Tenant's Work and attached hereto as Exhibit "C" and made a part hereof. All Tenant's Work shall be performed lien free by Tenant, in a good and workmanlike manner (employing materials of good quality) in compliance with all governmental requirements. In the event a mechanic's lien is filed against the demised premises or the Shopping Center on account of Tenant's Work, Tenant shall discharge or bond off same within ten (10) days from the filing thereof. If Tenant fails to discharge said lien, Landlord may bond off or pay same without inquiring into the validity or merits of such lien, and all sums so advanced shall be paid on demand by Tenant as additional rent. (d) From the date upon which the demised premises are delivered to Tenant for its work until the commencement date of the lease term, Tenant shall observe and perform all of its obligations under this Lease (except Tenant's obligation to operate and pay minimum rent, percentage rent and "Tenant's Proportionate Share" (defined in Section 16(c) below) of "Maintenance Costs" (defined and provided for in Section 16(b) hereof "real estate taxes" (defined and provided for in Section 28(b) hereof) and insurance (provided for in Section 28 hereof). In the event Tenant fails to open for business within one hundred twenty (120) days after the date possession of the demised premises has been delivered to Tenant, Landlord, in addition to any and all other available remedies, may require Tenant to pay to Landlord, in addition to all other rent and charges herein, as liquidated damages and not as a penalty, an amount equal to one-three hundred sixty five thousandths (1/365) of the annual minimum rent for each day such failure to open continues. (a) Provided Tenant has fully complied with all of the terms, provisions, and conditions on its part to be performed under this Lease and is not in default under this Lease, Tenant may, by giving written notice to the Landlord at least six (6) months on or before the expiration of the initial term of this Lease, extend such term for a period of five (5) years upon the same covenants and agreements as are herein set forth, except that the minimum rent during the first renewal term shall be increased to ______________________ Dollars ($_______) each month. (b) Provided Tenant has fully complied with all of the terms, provisions and conditions on its part to be performed under this Lease, is not in default under this Lease and has exercised its first option to renew hereunder, Tenant may, by giving written notice to the Landlord at least six (6) months on or before the expiration of the first extended term of this Lease, extend such term for an additional period of five (5) years upon the same covenants and agreements as the first extended term except that the minimum rent (as increased pursuant to Section 4(a) above) during this second renewal term shall be further increased to _________________ Dollars ($________) each month. (c) Provided Tenant has fully complied with all of the terms, provisions and conditions on its part to be performed under this Lease, is not in default under this Lease and has exercised its second option to renew hereunder, Tenant may, by giving written notice to the Landlord at least six (6) months on or before the expiration of the second extended term of this Lease, extend such term for an additional period of five (5) years upon the same covenants and agreements as the second extended term except that the minimum rent (as increased pursuant to Section 4(b) above) during this third renewal term shall be further increased to ______________ Dollars ($__________) each month. The initial term and any renewal term(s) are hereinafter collectively referred to as the "term".